I was a stray who was picked up by animal control. While I was there I was known as The Great Houdini because I was an escape artist. I prefer to think I have amazing problem solving abilities. I could open the gate to my kennel as well as those of other dogs in order to get some human attention. They tried a number of confinement techniques to keep me incarcerated but I could usually outsmart them. I am a happy girl who lives to please my people. Foster mom loves to see my happy dance when I get my tail wagging so fast that it spins like a helicopter blade. I love sleeping close to her in her bed and there is nothing to compare to curling up on the couch while we enjoy watching television together. I’ve gone through some health issues since I was rescued by As Good as Gold. 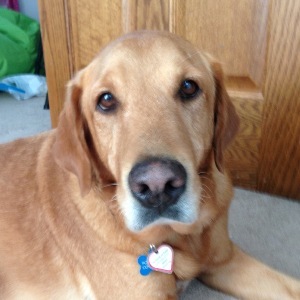 I was diagnosed with Heart Worm disease and went through four months of treatment. It was painful and I felt under the weather at times, but now those awful worms are past history as long as I take my Heart Worm preventative medication every month. I also had bladder stones. My veterinarian prescribed a special kibble which helped dissolve the stones and will help keep them from forming again. I will need to continue to eat this diet in order to stay healthy. I don’t like to be crated and I never get into any trouble when given free-run of the house while left alone. In the future, my teeth will need some attention. Foster mom is guessing that I probably damaged them by trying to chew my way out of the crate I was confined in. I do love to collect stray socks and proudly prance around with them for attention, but I would never damage anything I pick up. My fur foster brother and I are best buddies and enjoy playing tug of war or just hanging out. Foster mom says I can’t have stuffed animals because I like to “kill” them! There are times I get a little nervous around strange dogs so I try to take our introductions slowly. Kitties, however, don’t interest me at all. Car rides are always an adventure and I am a calm passenger during our excursions. Because I was on exercise restriction during my Heart Worm treatment, I need some time to relearn how to leash walk without pulling. That won’t take long with several jaunts a day! When there is thunder, lightning or fireworks I sometimes need some reassurance that everything is okay. Foster mom thinks I am a sweet gentle girl who will repay your love and attention with lots of kisses and face licks. I am ready to snuggle whenever and wherever!